We have compiled a list of answers to the most frequently asked questions about Harbour Splash, Dublin’s first inflatable aqua park, which we hope you find useful. If your questions are not answered, please feel free to email info@harboursplash.ie or call us on 01-5240602. During normal operating times, the youngest age allowed on the park is 8. Children aged 8-10 years have to be accompanied on the park by a parent/guardian. One adult can take a maximum of 3 children (this rule does not apply to school tours, please contact us by email info@harboursplash.ie or over the phone if you would like to book a school group). Children aged 10-15 need to have an adult on site for the duration of their session. We will offer special slow fun sessions for children aged 6/7 and their parents. Yes, you have to be able to swim 50 meters in a buoyancy aid in order to use the park. When completing your booking you confirm that you and all other members of your booking can swim the required distance. We would always recommend to pre-book your session to avoid disappointment, but it is also possible to book on site when you arrive. We can’t guarantee you a slot if you have not pre-booked. Please bear in mind that bookings for under 18s can be made online, but that a waiver has to be signed for them by a parent/guardian. If under 18s arrive on site and the waiver is not signed for them, they will lose their session and will not receive a refund. We recommend that you arrive at least 30-45 minutes before the start of your session to allow plenty of time to check-in, get changed and be ready for your safety briefing. If you arrive late, we cannot guarantee you that you will be able to go on your session. You would not receive a refund if you miss your session, so best to be on the safe side and leave with lots of time to spare. You will need swimwear and a towel. The session price includes free wetsuit rental, buoyancy aid and helmet. Yes, we have basic changing facilities on site. These have limited capacity, so please be prepared to change in the outdoor space we have designated for this (bring a changing towel, wear your swimwear under your clothes when you arrive). We don’t have access to showers or toilets, we recommend to treat a trip out to us like a trip to the beach. There are public toilets in the harbour nearby. We have a limited number of lockers where participants can safely store their belongings. These require a padlock that you can bring yourself or buy for €6 at reception. Yes, you will have to wear a wetsuit, either one of our free rental suits or you can bring your own. The session price includes free wetsuit rental and all safety equipment (buoyancy aids, helmets) is also free of charge. There is no discount available if you bring your own wetsuit. Yes, you are welcome to bring your own food/drink, but please bear in mind, that we don’t have the space for you to eat before or after your session on site. You can of course use the public space around the harbour. Food and drink are not allowed to be consumed in the changing areas. We operate a strict cancellation policy, so please be aware of that before you make your booking. All cancellations made by the customer must be made in writing and submitted via email or post. In the event of a cancellation or a request to reschedule more than 48 hours (7 days for group sessions with 10-24 participants; 14 days for group sessions with 25 or more participants or private hire events) before a session commences, we will refund the amount paid to date or reschedule the session (pending availability). In the event of cancellations/rescheduling less than 48 hours (7 days for group sessions with 10-24 participants; 14 days for group sessions with 25 or more participants or private hire events) before a session commences, the amount paid to date is forfeited. Non-attendance will result in the entire amount paid to date to be forfeited. For group bookings the final number of participants can be changed up to 7 days (for groups of 10-24 participants) or up to 14 days (for group sessions with 25 or more participants or private hire events) before the session starts (minimum numbers apply and prices may change if the number of participants changes) – this is the number of people that the customer will be charged for. The company reserves the right to cancel or reschedule a session at any time without any prior notice where we believe it is necessary due to unsuitable conditions. Rescheduling a session, for example due to weather, is not a cancellation. If a session has to be cancelled by the company, customers have the option to book into another session or to get a full refund. The park will operate in most weather conditions, unless there are very heavy winds/thunderstorms. If it is not possible for us to operate or we have to shorten a session, we will cancel your booking and you can decide whether you would like to receive a full refund or book onto another session. No shoes are worn on the park. No, pregnant people are not allowed on the park. Yes, there is a public car park right next to us (pay parking). We recommend to use public transport to get to us or to car pool as the car park gets very busy and we don’t want you to miss your session because you can’t find parking. Can I book a group online? Yes, you can make bookings for 1-50 people online yourself. Our booking system will calculate all applicable discounts for you and offer you the best rate possibel. 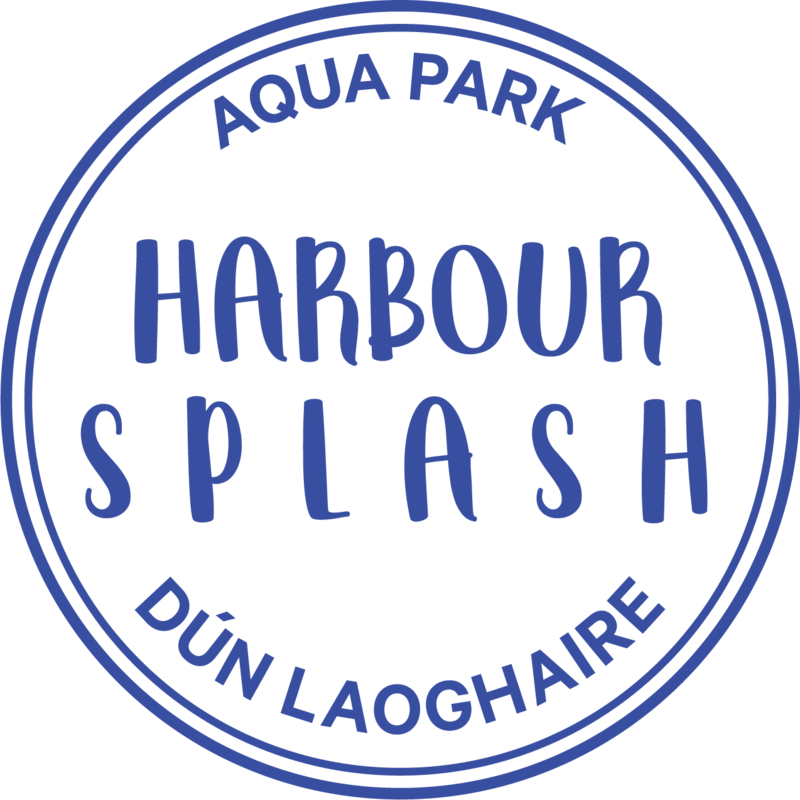 If you would like to make a booking for more than 50 people, please get in touch by email to info@harboursplash.ie or over the phone at 01-5240602. Can I wear glasses on the park? We strongly advise not to wear glasses on the park. You might lose them or they might get damaged. Contact lenses or prescription glasses would be best. There are discounts for groups of 4 or more participants (5% off the ticket price) and for 10 or more participants (€2 off the ticket price). We also offer a family ticket (2+2) for €74. When you make an online booking, the system will automatically calculate the cheapest rate for you. Discounted rates cannot be combined with other discounts. How do I complete the waiver form? Once you have made a booking you will be emailed a link to fill in the waiver form. Over 18s have to sign a waiver for themselves, under 18s need a parent/guardian to sign a waiver for them. All participants need waivers before going out on the park and if you miss your session because of delays filling it in on site you need to be aware that you won’t be able to get a refund. So best be prepared, sign the waiver online and arrive with plenty of time to get checked in and changed.